Inflammatory profiles in serum samples from RT-challenged Rhesus macaques. 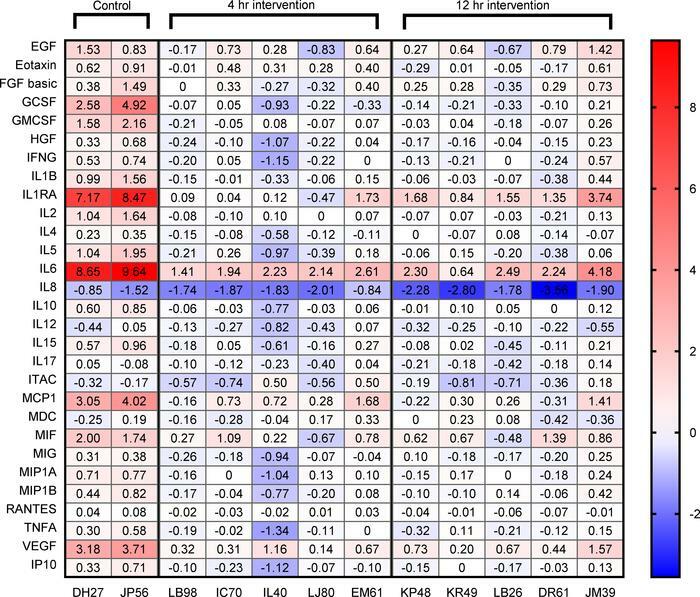 Heatmap presentation of log2-fold change values of cytokines, chemokines, and growth factors in the sera of 12 animals, comparing samples collected 24 hours after challenge with those collected 7 days before challenge. Animals are separated by column into their respective groups: control, 4-hour huPB10 intervention, and 12-hour huPB10 intervention. The specific cytokine, chemokine, or growth factor analyzed is indicated on the left. Boxes are color-coded (blue to red) according to scale bar shown on the right. Values are derived from a single 29-plex Luminex analysis.